The hate poem “Der Judenturm” appeared on the 30 April 1933 in the Leipziger Tageszeitung. It is directed at Hans Kroch (1887 Leipzig-1970 Jerusalem) a Jewish banker. Although his name is not explicitly mentioned in the poem, there is no doubt that he is the target: The tower in the title refers to the highest building in Leipzig known as the Kroch Hochhaus which was the Kroch bank building. The second line in the poem “Ein reicher Jude wie heist er doch” rhymes nicely with Kroch. I have translated the original German poem into English and both original and translation are given below. The translation is not verbatim, since I wanted to preserve the tempo and rhymes of the original. However, I did make the effort to keep the translation faithful to the spirit of the original. 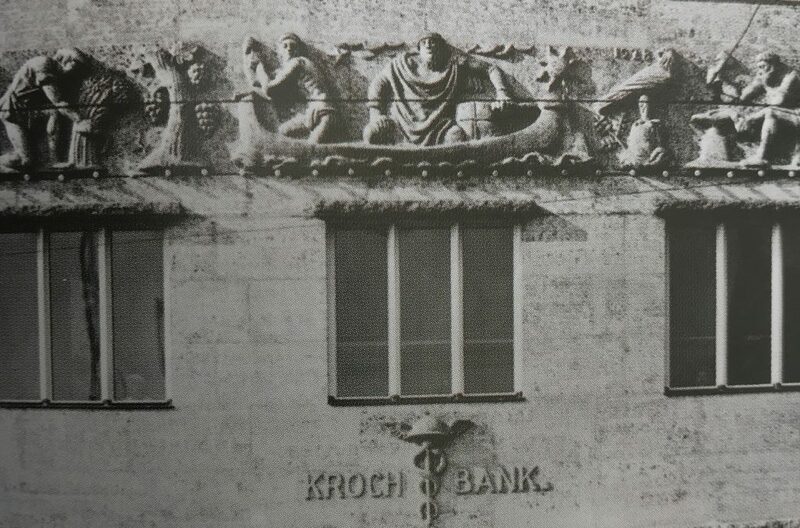 The poem refers to images on a frieze displayed at the front of the Kroch bank, shown between the English and German version. For us all to admire. Production lines and sickle sings. That we can see a Soviet stance? The tower of a Jewish bank. with Jewish beard just like a goat. With the steering in his hand. The fruits of your Goyim fitness. Ein reicher Jude wie heist er doch? daß hier des Sowjetstaat’s Symbol. bläht sich auf einem Wasserballen. und hält das Steuer in der Hand. strahlt ihm zunächst, das tut ihm wohl. steuert der Jud’ als Richtpunkt an. Die Klaue auf die Kugel legen. stellt sich gern dar die Judenschaft. voll Gier die ganze Welt ergreift. ganz oben unter’m flachen Dach. Er hat zwei linke Hände bloß. Ihr Gojim, spar ich meine Kraft.